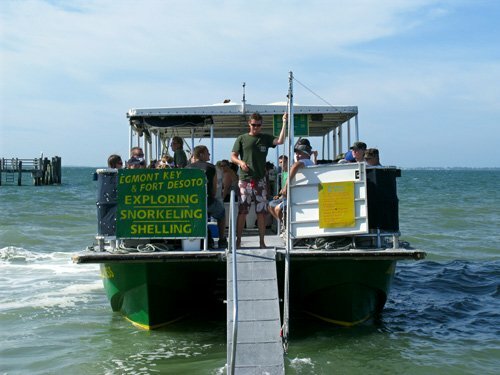 The Egmont Key Ferry transports visitors from Fort DeSoto Park, the most southern point of Pinellas County, to Egmont Key State Park. 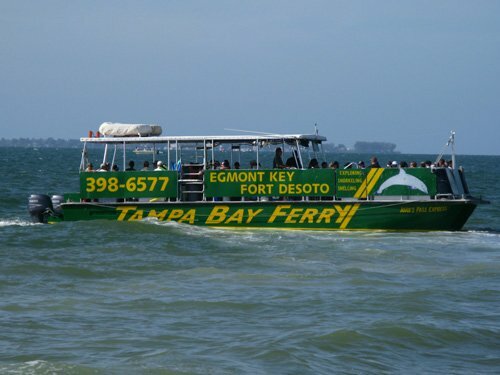 The ferry to Egmont Key runs twice each day (10:00am and 11:00am) during the regular season (Feb 17 - September 7.) It returns back to Fort DeSoto at 2:00pm and 3:00pm. The ferry is about 46 feet in length and has both covered and open area seating. You can see everything from dolphins playing in the surf, to huge tankers coming and going from Port Tampa. Leaving from Bay Pier Beach at Ft DeSoto Park, it takes about 15 minutes to reach the island of Egmont Key, a former military defense establishment, now a Florida state park. 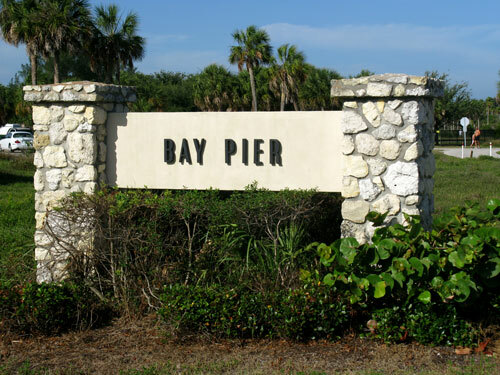 The Bay Pier sign is the landmark for the ferry parking lot. It actually shares the lot with the Fort DeSoto Dog Park. 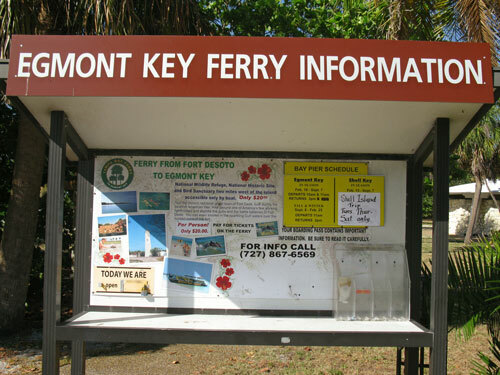 There is a large display that gives you all of the latest information about the ferry ride. 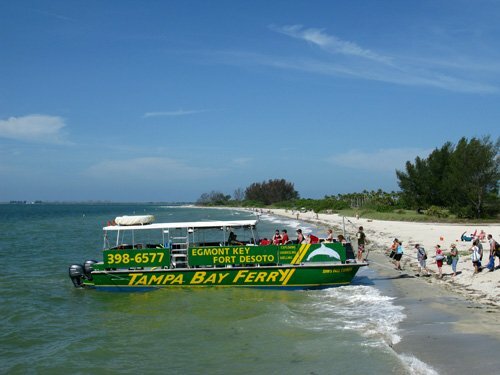 Passengers board the ferry to Egmont Key State Park. There is a clean restroom on it, as well as an assortment of chips, snacks, and pop. The first mate hauls up the front ramp as the ferry backs away from Bay Pier Beach. The ferry lands at this old wharf. 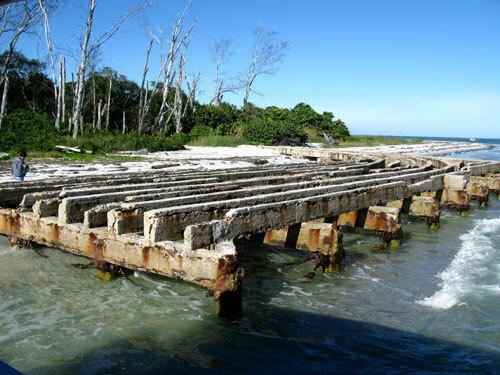 It was used for supplies to the defensive batteries on the island, as well as loading the mines to protect the entrance to Tampa Bay during the Spanish-American War. * Cash for tickets and refreshments. * Sunscreen and a hat. * Sneakers to hike around the island. Flip-flops do not work so good. * A large jug of water if you expect to be hiking for several hours. * Wear a watch so you do NOT miss the ride back to Fort DeSoto. If you are not on time, you get left. * Make sure you are back at the loading area at least 10 minutes early. Please be cognizant of the time for your return trip back to Fort DeSoto. You do NOT want to spend a night out on the island. The residents will not want you sleeping in their homes, and you will be out in the elements all night. Get back to the dock at least 10 minutes before the boat even docks for the return trip. If you get left, it is nobody's fault but yours. Do you like to snorkel or scuba dive? 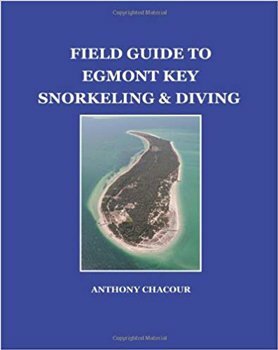 The Egmont Key Ferry will get you to this popular destination. Learn more about the adventures awaiting you.